A good leg holster is adjustable, so that you can find the perfect fit for your body. It should keep your weapon secure too for your own and others’ safety. All of the leg holsters that made it on our top six list have safety features and are comfortable. They are rated highly by customers as well. You are sure to find a high quality leg holster on this list, whether you need it for self-defense, hunting, law enforcement, or paintball. The Safariland Tactical Holster with Double Leg Straps features a self-locking system that prevents weapon takeaway. Its self-locking system also enables a smooth single-motion draw. Your handgun’s finish is preserved thanks to the suede-lining inside the holster. The holster contains Safari laminate Thermal Molded construction to further protect your weapon. It also has mounting holes, so you can add accessories. Safari Tactical Holsters are made in the USA, a selling point for those who prefer American products. They are also manufactured in right and left hand versions. Price: $158.26 for right hand, $159.03 for left hand. The BLACKHAWK! Serpa Level 3 Tactical Black Holster was designed with comfort, breathability, and stability in mind. It features a Y-harness suspension system that keeps the weapon in place while kneeling. You can easily move around and kneel with the holster on. The holster is fast to mount and dismount thanks to the quick-disconnect swivel buckles. It also comes with accessory mounting locations, so that you can carry knives, mag cases, and pouches with you. 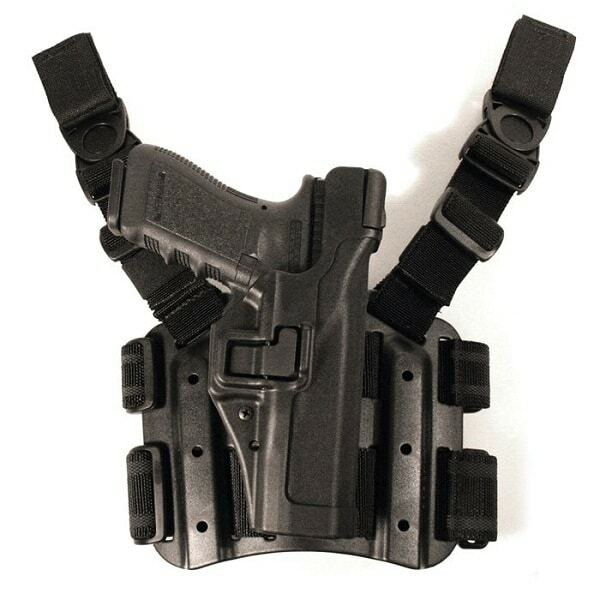 The rubberized leg straps keeps this tactical holster securely in place during movement. BLACKHAWK! Serpa Level 3 Tactical Black Holster is available in both left and right hand draw versions. Price: $99.49 – $292.26, depending on which size you buy and whether it’s right or left hand. 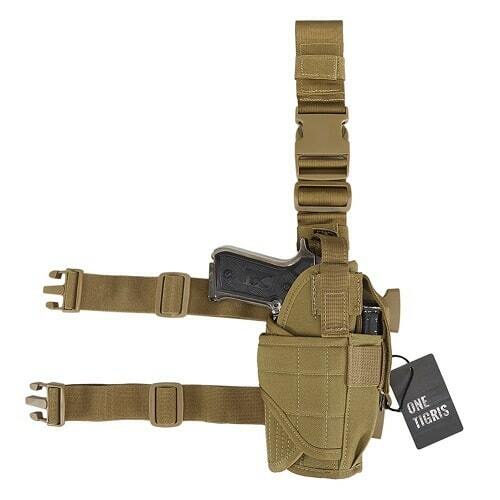 This tactical holster features a fully adjustable leg strap, non-slip rubber lining, and a quick release buckle. It’s both comfortable and safe to use. You can adjust the holster to the right setting for your body. For additional security, the design has an extra velcro strap to secure your weapon. Its wrap-around design can accommodate pistols with a laser or flashlight mount. 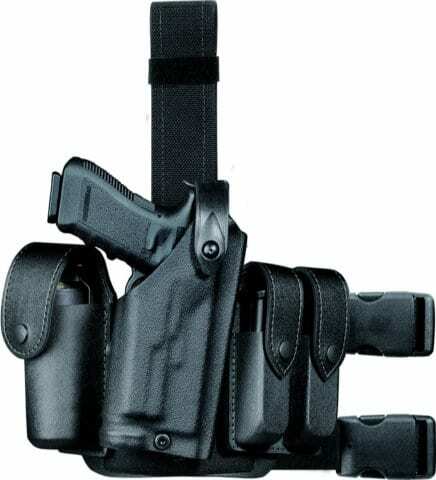 The convenient holster also comes with a magazine pouch secured via an adjustable velcro strap. Medium and large pistols fit inside the Condor Tornado Tactical Leg Holster. It’s available in three colors: olive drab, black, and multicam. Price: $22.95 in olive drab, $22.93 in black, $27.95 in multicam. 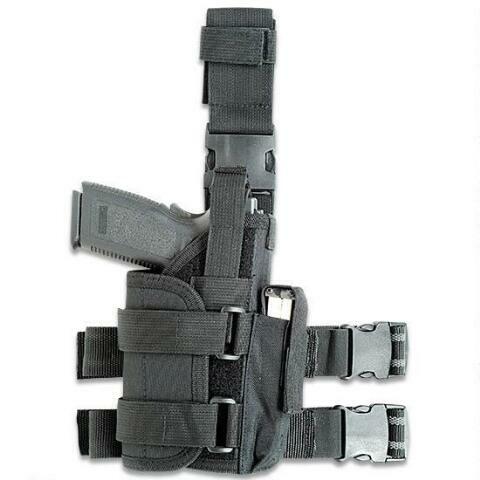 Suitable for law enforcement use, the UTG Extreme Ops 188 Tactical Leg Holster is also good for gun enthusiasts. The height and tension are fully adjustable, making it a comfortable holster to wear. It also has composite padding, high quality velcro straps, and a quick release buckle system for comfort and safety. Your weapon is always readily available thanks to the holster’s tactical design. It has an extra magazine pouch attached too. Most medium and large pistols and flashlights will fit inside this holster. The Carlebben Elite Molle Drop Leg Holster gun holster is fully adjustable, fitting anyone from an adult S to XXL. It has non-slip rubber lining to hold the holster in place throughout the day. One magazine pouch with an adjustable velcro strap comes with the product. The holster can fit pistols with a laser or flashlight mount. It’s most ideal for medium to large automatics. Made of 1000D nylon, the holster is waterproof, wear-resistant, and lightweight. It is ideal for law enforcement, military service members, hunters, and people who carry for self-defense. Product is available in four colors: green, camouflage, brown, and black. 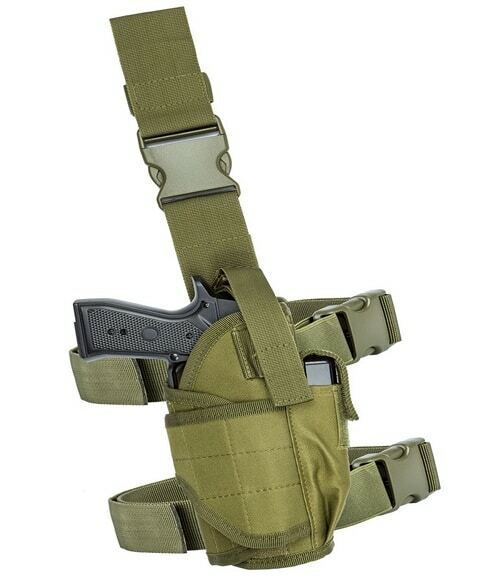 An elastic leg strap makes the OneTigris Drop Leg Tactical Holster comfortable to wear. It’s adjustable up to 19.68 inches in leg circumference and 9.45-15.75 inches in height. The product’s retention system enables fast cross-draw and keeps your weapon facing downward. 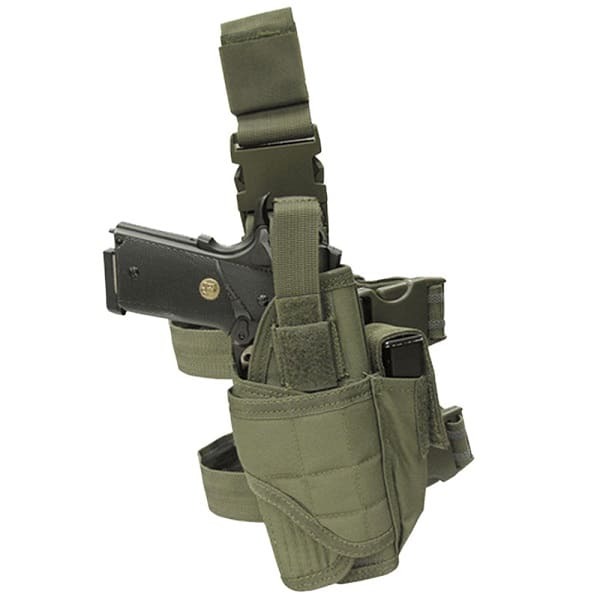 The holster comes with a spare magazine pouch with an adjustable hook-and-loop closure. You could fit a laser, flashlight, and other accessories in the pouch too. The tactical holster is suitable for a wide variety of uses, including military, law enforcement, open carry for self-defense, and paintball. Price: $19.12 for tan version, $19.05 for black version. If you want to carry a gun on your leg, it’s important to find a holster that’s both comfortable and safe. You don’t want your gun falling out of the holster or sliding down while walking. The six leg holsters listed above are some of the best holsters for leg carry – comfortable and safe to use. Common features across the board that make these holsters top-notch are adjustable straps, velcro straps, and tactical designs. Each also uses a certain material that prevents the holster from sliding or moving around. What do you think of this top six list of gun holsters for leg carry? See one you’d like to try? Hey Buddy!, I found this information for you: "Top 6 Leg Holster Options for Comfort and Safety". Here is the website link: https://thegunrights.com/leg-holster/. Thank you.